The May 9th Victory Day has revived the Mongolian love for Russia once again. Mongolians were watching the Victory Day parade and Mongolian social media was trending on any story which relates to the Great Victory. Wreaths were laid at the monuments of Zaisan hill in Ulaanbaatar, remembering the Soviet soldiers who defended the world from the Nazis. The case of the Lavrov jeans is forgiven and forgotten. 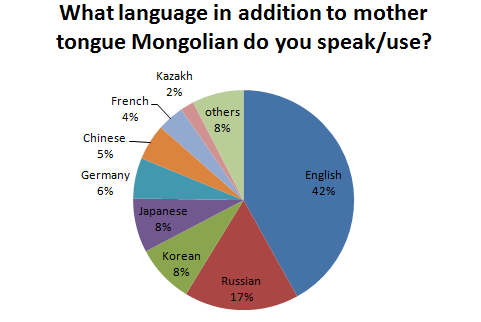 Although I didn’t plan it to coincide with May, my quick poll on Russian language use in Mongolia seems nicely timed. 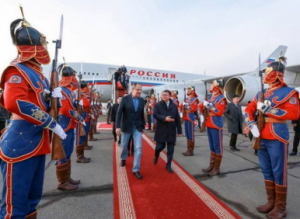 Russian Minister S. Lavrov’s dress code for official welcoming on his visit to Mongolia in April, 2016 attracted many discussion around Russia Mongolia relationship. The Russian language has been revered as a language of class, education and identity in Mongolia. A quick (social media) poll to the question “In addition to your mother tongue Mongolian, what other language do you speak/use?” suggests English is taking over from Russian as the preferred second language in Mongolia. However, Russian language holds a strong root in Mongolian society and culture. Considering the rise of China globally and the China-Mongolia relationship it is interesting to note that the Chinese language did not quite make it to the top 5 foreign languages in the poll. In order to group the Russian-speakers by generations (with the aim to examine a hypothesis that new generation is choosing other foreign languages over Russian) I ran parallel polls on Facebook and Twitter and asked participants which generation they belong to. The majority of participants were from the 1970s and 80s with a total of 61 out of 85. The number gradually declined in the 90s represented by 16 and 2000s with 1 participant. Surprisingly, a low number of 7 selected the 60s (in opposition to my guess that older people are more likely to know Russian). But this could be explained by the fact that many from this generation do not use Facebook as a main platform of engagement. Russian still is a very useful language to establish connections and make friends with the people who are running the show in Mongolia, as those generations from 60s to 80s are in decision-making positions in the government and business sectors. But for Mongolians, I think we should learn our Mongolian language well, and then as boastful as we are of our linguistic abilities, we could learn (at least) Russian, Chinese and English to survive and thrive as Mongols. This entry was posted in Bulgan Batdorj, Education, Foreign Policy, Kazakhs, Nationalism, Russia, Social Change, Society and Culture and tagged Batdorj BULGAN. Bookmark the permalink.